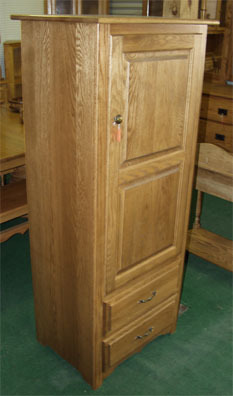 Our Amish made oak pantry cabinets have been very popular items on our web site, and customers are constantly asking us for different sizes and shapes. We are more than happy to have them custom built to whatever specifications you need - in fact we do it all the time, so if you are building a new house, or have any other special space to fill just let us know. This one is for those folks looking for something smaller. It is a “single wide” version, and features a cupboard on top with two adjustable shelves behind it, and two drawers on the bottom that are 5” deep. Crafted by the Amish in solid oak, and available in a variety of finishes to match your decor.